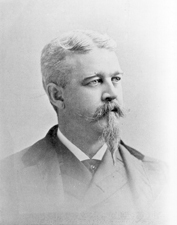 GIBSON, Charles Hopper, (cousin of Henry Richard Gibson), a Representative and a Senator from Maryland; born near Centerville, Queen Anne County, Md., January 19, 1842; attended Centerville Academy and the Archer School in Harford County; graduated from Washington College, Chestertown, Md. ; studied law; admitted to the bar in 1864 and commenced practice in Easton, Md. ; appointed by President Andrew Johnson in 1867 collector of internal revenue for the Eastern Shore district, but was not confirmed; auditor and commissioner in chancery in 1869 and resigned in 1870 to accept the appointment of States attorney for Talbot County 1871-1875; elected as a Democrat to the Forty-ninth, Fiftieth, and Fifty-first Congresses (March 4, 1885-March 3, 1891); was not a candidate for reelection in 1890; appointed and subsequently elected as a Democrat to the United States Senate to fill the vacancy caused by the death of Ephraim K. Wilson and served from November 19, 1891, to March 3, 1897; chairman, Committee on Manufactures (Fifty-third Congress); resumed the practice of law; died in Washington, D.C., March 31, 1900; interment in Chesterfield Cemetery, Centerville, Md.